We introduced you guys to this incredible couple in their engagement session blog, and we told you a little bit about their “modern day romance.” They met online! Sometimes, we love the internet so much, because it takes two amazing strangers and creates one of the sweetest, most joyful and easy going couples we know. 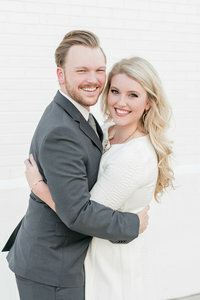 Amanda and Brandon are perfect for each other, and aren’t they beautiful together!? We loved every detail of Amanda and Brandon’s big day, and it was so much fun to photograph. First, Amanda’s gorgeous blush ballgown was the perfect dress for twirling (and she twirled indeed – you’ll see below!). And the florals from Hothouse Design Studio added the prettiest pops of colors. Speaking of pops – the cake pops and the delicious cake styled with geometric shapes and bright bold color were a hit! We were in photographer heaven! Park Crest Event Facility served as a gorgeous backdrop for such a beautiful day, and our friends at Becky’s Brides made sure everything went perfectly! Mr. and Mrs. Cook – you two had the most amazing wedding day! But, you could have gotten married in potato sacks, and it would still have been one of the most special days we’ve gotten to be a part of! You two are something so special, and we know your marriage will bless so many. Congratulations! We love you guys!